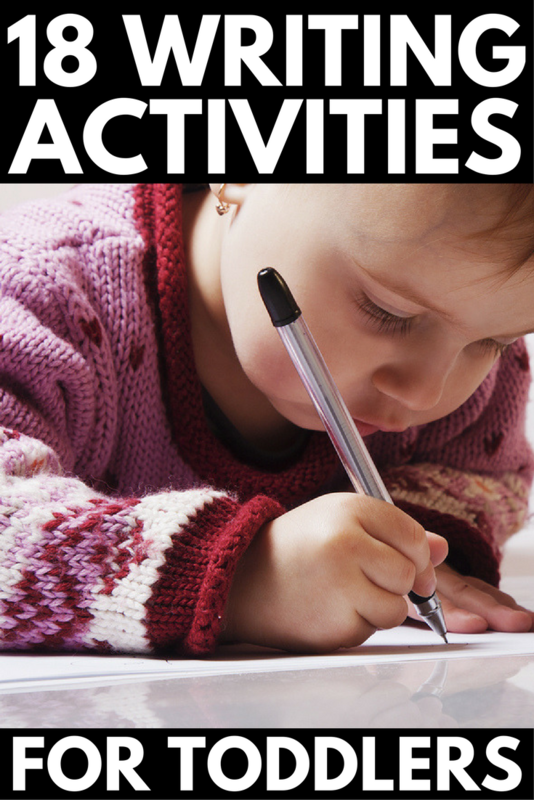 If you’re looking for writing activities for toddlers, you’ve come to the right place! From how to teach a child to hold a pencil correctly to letter learning activities, pre-writing exercises, and preschool letter practice, we’ve pulled together lots of FUN ideas to help you teach your child how to write her name before she starts preschool in the fall. Because, let’s face it: preschool is the new kindergarten. It used to be that kids went to preschool to learn the social skills and independence needed for kindergarten. Sure, they learned other skills along the way, but the approach was purely play-based, allowing kids ample time to develop their gross and fine motor skills while engaging in imaginative and cooperative play with their peers. But in a day and age where kids are expected to know their letters, numbers, shapes, and colors as well as how to read and write their name before the age of 4, school readiness is top of mind for many parents. And as tempting as it is to go against the masses and spend our days organizing playdates for our little ones instead of engaging them in preschool letter practice, none of us want our children to start school behind their peers. And so we do what we feel we’re supposed to do. The good news is that we’ve rounded up 18 writing activities for toddlers that feel more like play than practice, and we’ve broken them down into a logical sequence to help your child learn how to write the alphabet the easy way. The Writing CLAW: What I love about this grip is that it can be used with pencils, markers, paint brushes, and eating utensils, and it’s touted as a top-pick for kids with special needs who struggle with the fine motor skills needed for handwriting. The Pencil Grip: Unlike older pencil grips, the soft, flexible material of this grip offers a comfortable way for kids to learn how to maintain the proper tripod grip needed for handwriting, and the ergonomic design helps reduce hand fatigue. The Grotto Grip: Designed by an occupational therapist, this pencil grip will ensure your child’s fingers don’t slip while she’s writing, and based on the reviews I’ve read online, a lot of teachers and parents swear by it! While it may be tempting to dive right into all of the fun writing activities for toddlers that are floating around Pinterest, a great first step in preschool letter practice is to work with your child on letter recognition. We were huge fans of LeapFrog toys when my daughter was younger (I highly recommend The Letter Factory DVD! ), but there are tons of fun DIY learning activities you can do at home to get your little one excited to learn how to write the alphabet that are relatively easy and inexpensive to recreate. Here are 6 ideas to get your creative juices flowing! While teaching your child the correct way to hold a pencil and engaging her in letter recognition activities are important in helping her learn how to write the alphabet, it is also important to focus on fine motor tasks to help improve your child’s manual dexterity by strengthening the muscles in her hands and fingers needed to develop her handwriting skills. This can be as simple as cutting Play-Doh up with a pair of Play-Doh scissors or working with grabber tweezers. The point is to improve your child’s in-hand manipulation skills, and the following pre writing exercises for toddlers offer fabulous ideas on the types of activities you should be focusing on to help develop the muscles in your child’s hands and fingers. If you plug the words ‘writing activities for toddlers’ into Google, a lot of really cool ideas pop up. There are tracing letter practice sheets, dry erase books, and LeapFrog has a really cool Scribble and Write toy, but there are lots of other genius writing activities for toddlers you can recreate using things you already have lying around your house. Who knew shaving cream, Q-tips, flour, and food coloring could be so much fun?! As you can see, equipping kids with the tools they need to learn how to write the alphabet isn’t as easy as sitting them down with a stack of paper and a box of crayons. There’s a science behind learning how to write, and while the internet is full of fun writing activities for toddlers, there are certain fundamentals your little one needs to accomplish first, like learning how to hold a pencil and developing her fine motor skills. If you liked this collection of writing activities for toddlers, please share this post on Pinterest! And if you’re looking for more ways to have fun with your kids, please follow our Kids board where we share all kinds of fabulous ideas!